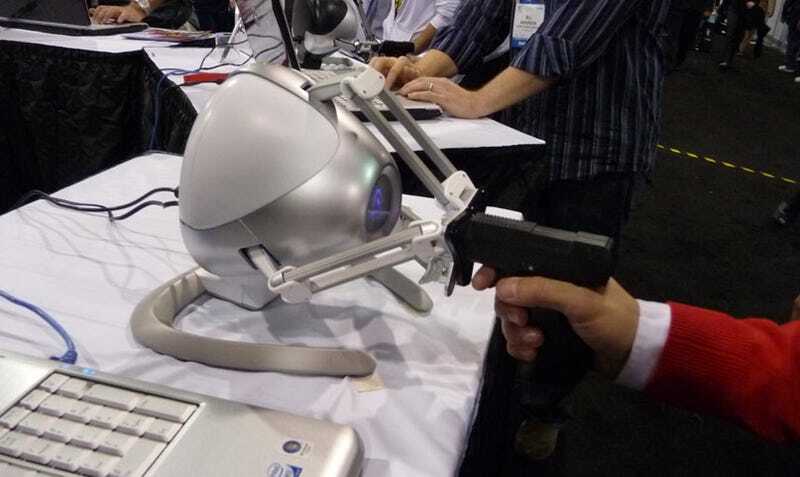 CES 09: Novint Falcon + Pistol Grip + Left 4 Dead = ? Novint's Falcon doesn't currently support Valve's Left 4 Dead or The Orange Box, but the curious looking controller supported both at CES. How useful is it and the pistol grip in games like these? While it, like much of the wares at the Consumer Electronics Show, answers a technology question that very few asked, the Falcon feels great, after becoming acclimated to its unusual control scheme, based on our quick hands on time with Valve's latest. That pistol grip similarly feels like a natural fit after a few minutes. The Falcon's realistic kickback, however, is going to seriously limit how often you'd use this thing in a game like Left 4 Dead. The intense force feedback you'll feel when squeezing off a shotgun round or dropping from a ledge can be disorienting. Fortunately, these effects can be scaled back or turned off altogether. If you think mice and trackballs just aren't giving you enough trigger squeezing feel, the Novint Falcon may make your zombie apocalypse feel that much more authentic.